This self-contained file contains Open Source Physics programs for the teaching of time evolution and visualization of quantum-mechanical bound states. The suite of programs is based on the ability to expand an arbitrary wave function in terms of basis vectors in a reduced Hilbert space (the superposition principle). One can choose from several real-time visualizations, such as the position and momentum expectation values and the Wigner quasi-probability distribution for position and momentum. We describe how these tools can be used to study the long-term time-dependent properties of quantum-mechanical systems. The materials and text of this resource appeared in an article of the same name in the Theme Double-Issue on Computation and Computer-based Instruction in the American Journal of Physics [Am. J. Phys. 76, No. 4&5, pp. 385-392 (2008)]. This resource was featured by the Quantum Exchange collection from April 13, 2008 until June 30, 2008. View the feature here! M. Belloni and W. Christian, , Version 1.0 (2008), WWW Document, (https://www.compadre.org/Repository/document/ServeFile.cfm?ID=6475&DocID=273). M. Belloni and W. Christian, Numerical Time Development in Quantum Mechanics Using a Reduced Hilbert Space Approach, , Version 1.0 (2008), <https://www.compadre.org/Repository/document/ServeFile.cfm?ID=6475&DocID=273>. Belloni, Mario, and Wolfgang Christian. Numerical Time Development in Quantum Mechanics Using a Reduced Hilbert Space Approach. February 5, 2008. https://www.compadre.org/Repository/document/ServeFile.cfm?ID=6475&DocID=273 (accessed 24 April 2019). Belloni, Mario, and Wolfgang Christian. Numerical Time Development in Quantum Mechanics Using a Reduced Hilbert Space Approach. Vers. 1.0. 2008. 5 Feb. 2008. 24 Apr. 2019 <https://www.compadre.org/Repository/document/ServeFile.cfm?ID=6475&DocID=273>. The Numerical Time Development in Quantum Mechanics Using a Reduced Hilbert Space Approach Package contains a collection of OSP programs for the study quantum-mechanical concepts. This article describes the OSP-based programs and shows how OSP-based materials can be used to study quantum-mechanical concepts. 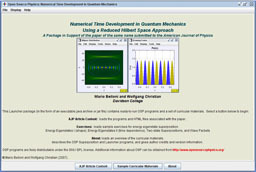 The Numerical Time Development in Quantum Mechanics Using a Reduced Hilbert Space Approach Package contains curricular materials for the teaching of quantum mechanics using the QM Superposition Program. The Numerical Time Development in Quantum Mechanics Using a Reduced Hilbert Space Approach Package contains curricular materials for the teaching of quantum mechanics using the QM Wigner Program. The Numerical Time Development in Quantum Mechanics Using a Reduced Hilbert Space Approach Package contains curricular materials for the teaching of quantum mechanics using the QM Projection Program.